Regulations seen in RED TEXT denote changes in the freshwater fishing regulations that have occurred since the publication of the 2018–2019 Freshwater Sport Fishing regulations booklet. New Section 2.05. Leader Length Restriction. It shall be unlawful to use any configuration of fishing tackle in anadromous waters unless the distance between the terminal hook or terminal lure and any weight attached to the line or leader, whether fixed or sliding, is less than six feet. For purposes of this section, “weight” includes any product used to submerge the line or leader, including non-buoyant artificial flies or artificial lures, but does not include integrated or sinking fly fishing lines, lead core lines used while trolling from a boat, dropper weights used while trolling from a boat, or clipped weights used with downrigger systems. (A) From Nimbus Dam to the the U.S. Geological Survey gauging station cable crossing about 300 yards downstream from the Nimbus Hatchery fish rack site. Closed to all fishing all year. (B) From the U.S. Geological Survey gauging station cable crossing about 300 yards down-stream from the Nimbus Hatchery fish rack site to the SMUD power line crossing at the southwest boundary of Ancil Hoffman Park. Jan. 1 through July 15. Only barbless hooks may be used. July 16 through Oct. 31. (C) From the SMUD power line crossing at the southwest boundary of Ancil Hoffman Park downstream to the Jibboom Street bridge. July 16 through Dec. 31. (D) From the Jibboom Street bridge to the mouth. July 16 through Dec. 16. Dec. 17 through Dec. 31. (68) Feather River below Oroville Dam (Butte, Sutter and Yuba cos.). (A) From Fish Barrier Dam to Table Mountain bicycle bridge in Oroville. Closed to all fishing all year. (B) From Table Mountain bicycle bridge to Highway 70 bridge. Jan. 1 through July 15. Only barbless hooks may be used. (C) From Highway 70 bridge to the unimproved boat ramp above the Thermalito Afterbay Outfall. (D) From the unimproved boat ramp above the Thermalito Afterbay Outfall to 200 yards above the Live Oak boat ramp. July 16 through Oct. 15. Oct. 16 through Dec. 31. (E) From 200 yards above Live Oak boat ramp to the mouth. For purposes of this regulation, the lower boundary is defined as a straight line drawn from the peninsula point on the west bank to the Verona Marine boat ramp. Dec. 17 to Dec. 31. 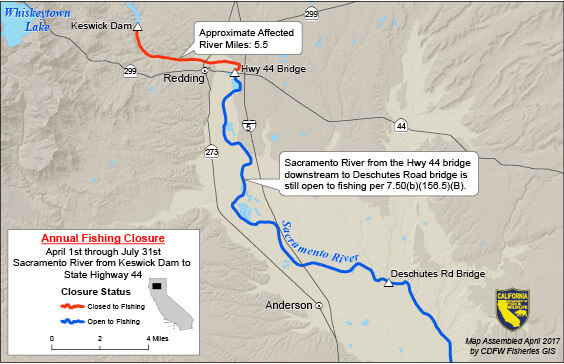 (156.5) Sacramento River and tributaries below Keswick Dam (Butte, Colusa, Contra Costa, Glenn, Sacramento, Solano, Sutter, Tehama and Yolo Cos.). Also see Sierra District General Regulations (See Section 7.00(b)). (A) Sacramento River from Keswick Dam to 650 feet below Keswick Dam. 1. From 650 feet below Keswick Dam to the Highway 44 bridge. Closed to all fishing from Apr. 1 through July 31. Aug. 1 through March 31. Only barbless hooks may be used. 2. From the Highway 44 bridge to the Deschutes Road bridge. All year. Only barbless hooks may be used. (C) Sacramento River from the Deschutes Road bridge to the Red Bluff Diversion Dam. Jan. 1 through July 31. Aug. 1 through Dec. 16. (E) Sacramento River from the Hwy 113 bridge near Knights Landing to the Carquinez Bridge (includes Suisun Bay, Grizzly Bay and all tributary sloughs west of Highway 160). Note: It is unlawful to take fish 0-250 feet downstream from the overflow side of the Fremont and Sacramento Weirs. **Hatchery trout or steelhead are those showing a healed adipose fin clip (adipose fin is absent). Unless otherwise provided, all other trout and steelhead must be immediately released. Wild trout or steelhead are those not showing a healed adipose fin clip (adipose fin is present).